We have finally finished getting set up in our new location!!! 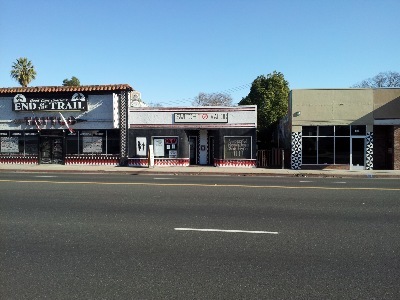 We are located at 518 McHenry Ave in Modesto, right next door to "End of the Trail Tattoos". We have also extended our hours to be more accessible for all of our valued customers. We are beyond excited to announce that we have recently partnered with a new line of distribution which has allowed us to pass along unbelievable price reductions to our valued customers. We now carry a full line of genuine Joytech products at prices well below suggested retail. We have been striving since we opened to be able to provide pricing competitive to that found online and have finally been able to accomplish just that!! Now there's no more waiting by the mailbox and crossing your fingers that everything will work. Just come on in and try everything before you walk out the door. No waiting, no shipping costs and no uncertainty.... just quality products at affordable prices. We are excited to announce that we are offering a store wide price reduction!! Our e-liquid prices are now comparable to what you can get it for online!! Don't forget, we always provide free samples with no obligation to buy!! Come on in and try the best products on the market!! Quit without quitting!! A low cost and healthier alternative to cigarettes!! Quit without quitting!! A low cost and healthier alternative to cigarettes!! No second hand smoke!! No odor!! Dont quit, just switch!! Become a non-smoker and still enjoy "smoking" today!! There are over 4,000 deadly chemicals and carcinogens in cigarette smoke; including tar, acetone, ammonia, formaldehyde, benzene, & arsenic. Nicotine vapor contains only water, nicotine, flavoring, and propylene glycol (a safe food additive found in everything from ice cream, to food coloring, to cake mix). As a smoker for over 25 years, and up to 3 packs a day. (That little fact is a little humiliating and I never would have admitted it before) I am amazed at how easy it was to switch. If not for the fact that my Dr. says that I'm not, I'd still consider myself a smoker. I tuned anyone out whenever I heard the word "quit" and resigned myself to the fact that I'd die of a smoke related illness. Sad, ...but true. I switched to vapor on 4/9/12 with the idea that if I wanted a cigarette, I'd have one. I still have the 9 cigarettes in the pack on my dresser I had that day. The thought of smoking one makes me queasy. I still get nicotine but none of the 4000 deadly chemicals that cigarettes contain. The vapor tastes and feels like real smoke, but has no lingering odor and dissipates almost immediately. I love that I don't smell like an ashtray, I don't have to go outside or stop the car and get out, and I feel 1000 times better. Not to mention the fact that the e-liquid comes out to the equivelant to under $1.00 a pack compared to traditional cigarettes. My monthly bill dropped by over 80%!!!! I was so impressed that we decided to open a store. We carry a full line of vaporizers and about 100 flavors and strengths of e-liquid, as well as a few of the better quality e-cigarettes. Contact me anytime to hear more about how to switch to vapor today! 1) No Cancer Causing Toxins! The nicotine vapor contains no tar, carbon monoxide, acetone, ammonia, formaldehyde, benzene, arsenic, or other harmful chemicals that are found in regular cigarettes. Normal tobacco cigarettes have over 4,000 harmful poisons that are not found in nicotine vapor. So, technically and legally we can not say the nicotine vapor is healthy. But, if you quit inhaling all of these horrible poisons you will be doing something healthier than smoking. 2) Saves You Money! Nicotine vaporizers are a lot less expensive than smoking regular cigarettes. The traditional pack of cigarettes costs between $5 and $6 per pack. You can refill your cartomizer for about a $1.00 and each refill is approximately equal to 1 ½ packs of traditional cigarettes. That is about 90% savings on every pack! Savings calculation based on user refilling cartomizer with e-liquid. 1 ml of e-liquid = about 1 pack of regular cigarettes. The cost of our e-liquid is equivalent to about $8 a carton. 3) No Smoke Produced Nicotine vaporizers produce water vapor and only when you inhale, they do not smoke or smolder! There are no pollutants being released into the air every time you light up. It's the pollution free alternative to traditional cigarettes. 4) No Second Hand Smoke Worried about second-hand smoke harming or annoying everyone around you? Well not anymore because the nicotine vaporizer produces NO second hand smoke. Now, you can keep everyone around you happy and safe by using a nicotine vaporizer. The vapor that is released looks like smoke, but is only water vapor that disappears in a few seconds and does not leave an odor behind. 5) No Stale Smoke Smell No more smoke stinking up your hair and clothes. Or stinking up your home or car. When you use a nicotine vaporizer, you breathe out pure water vapor which contains no odor. 6) Smoke In More Places Nicotine vaporizers allow you to get your nicotine fix in places where smoking is not permitted as it will not set off any smoke detectors or produce a lingering smoke cloud. Now you can calm your cravings at work, in the restaurant, at the bar, or airport without having to step out for a 'smoking break'. Be sure to get permission from the establishment you are visiting or just step into the restroom for a quick nicotine fix. 7) Save Even More With Lower Insurance Premiums Tobacco users pay the highest insurance rates. The insurance companies consider tobacco harmful to your health. They consider it a distraction while driving. And they assume you are more at risk to burn your house down. Once you quit tobacco for good be sure to call your insurance companies and let them know you are smoke free and want a better rate! 8) No More Coughing Once you are free from cigarettes and their poisons you will see your breathing improve and your smokers cough disappear. Day by day you will feel better and healthier. Nicotine vaporizer users state that they feel better, look better and breathe better. 9) No More Matches or Lighters Never search or fumble for a lighter or match again! Nicotine vaporizers are non-flammable. Ever have to light up with the stove burner because you couldn't find your lighter? Those days are over. 10) No More Stinky Ashtrays Nicotine vaporizers do not produce any ashes or butts to dispose of, so you no longer need ash trays. Simply put your nicotine vaporizer in your pocket when you are done or set it anywhere it's perfectly safe. A lanyard is a perfect way to keep it at hand by hanging around your neck. Never be without it. 11) No More Burn Holes No more burn hole ruined carpet, clothes, furniture or car! Since nicotine vaporizers are not lit and do not heat up it is impossible for you to burn a hole in anything. 12) No More Stained Teeth Nicotine vapor does not stain your teeth yellow or leave you with disgusting smoker’s breath. 13) No More Stained Walls or Furniture Since no smoke is produced there will be no disgusting residue to build up on walls or furniture. Spend less time cleaning and deodorizing your home and car. 14) Stay In And Keep Warm Most smokers aren't allowed to smoke in their own homes due to the health concerns of their spouse and kids and are thus forced out into the cold during the winter months. Start getting your fix indoors again without offending the family. Just stay in your recliner during half time, no more jumping up and running outside for a smoke during the commercials. 15) No Chance Of Burning Down The House Even if you fall asleep while “vaping” you will not burn yourself or your house down! That's a relief, especially for those groggy night time smokers. 16) No More Dropped Ashes Don't you hate it when you have an inch of cigarette ashes that need to be flicked and the ash tray is across the room. 9 out of 10 times those ashes don't make it to safety and you have another mess to clean up or burn hole to worry about. 17) No More Guilty Feelings You know you should quit. You want to quit. But you just can't and are always feeling guilty about being a smoker. So, don't quit. Just start using a nicotine vaporizer and you get all of the pleasure and none of the guilt. 18) Add Your Benefit Here By now you've thought up more benefits by using a nicotine vaporizer. You just want to live better, feel better and do more. Without smoking you'll have more stamina, more energy, more money, more time....the list is endless. Be Healthy. Be Wealthy. Be Wise. Quit Without Quitting Now.